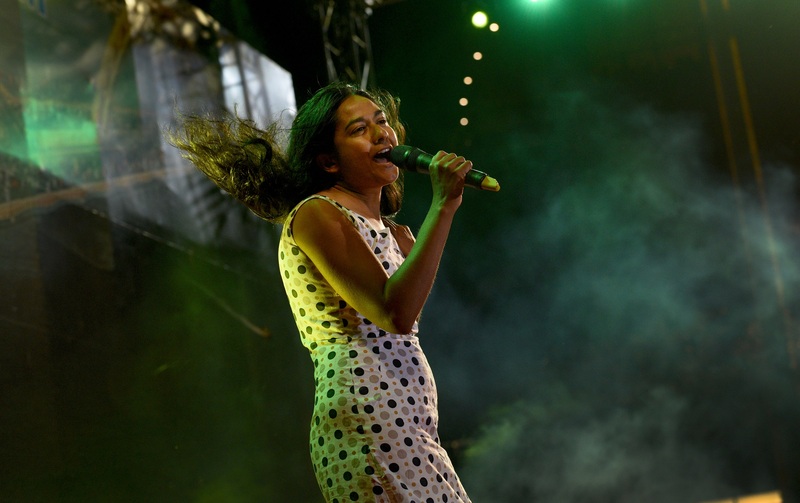 Clipper Race crew stole the show at Da Nang’s Art and Cultural night in the Race Village, as hundreds gathered to watch a variety of performances by local artists, dance groups and 2015-16 race crew members. 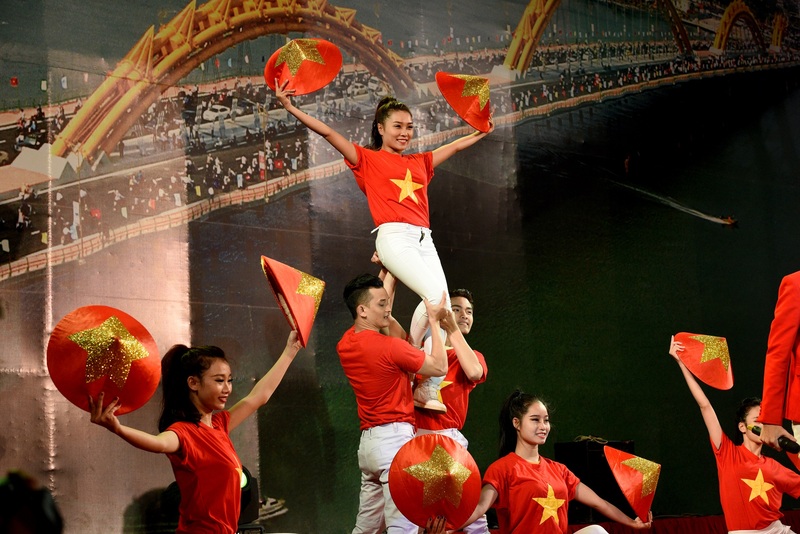 In the latest of a long list of events organised by the city of Da Nang during this stopover, crew were invited to partake and display their talents at the Art and Cultural Exchange Show, much to the delight of the audience. Phil Orford, a circumnavigator on GREAT Britain, was the first individual performance of the night, reading a poem he wrote en route to Da Nang from The Whitsundays. Entitled “The Race of Our Lives – Part 1” the prose describes the challenge the crew have undertaken in crossing the world’s oceans. 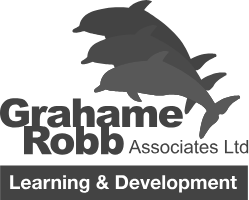 After his recital, Phil said: “Another fantastic Da Nang experience. 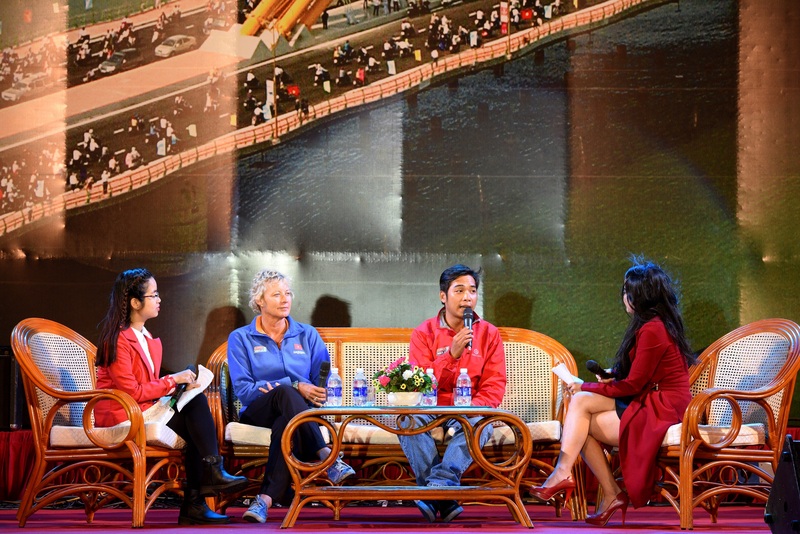 This has been an absolutely wonderful stopover and to be able to recite a poem that I’ve really only just written on this race over to Da Nang and read it for the first time to a big Da Nang audience was something really special for me. Next up was Phil’s team mate Amanda Navalkar, 44, who is also sailing round the world. Amanda’s performance of James Blunt’s Top Ten hit Bonfire Heart had the crowd on their feet and waving along. “It was a really enjoyable experience, to be up there representing myteam,” she commented. “I chose Bonfire Heart by James Blunt because he is a British artist, I thought that was appropriate. “I’ve never performed in front of that number of people before. It was a great opportunity to do something out here in Da Nang and made me feel good about myself. I couldn’t see much off stage because of the smoke machines and lighting but I could hear people clapping along and felt really supported. The final Clipper Race performance of the evening was by LMAX Exchange circumnavigator Vanessa Jubenot who danced the tango with a Vietnamese partner Nguyen Cuong. After having only a couple of hours to practice together they wowed the crowd. “It feels so good to dance again. I haven’t done it for almost a year. My partner is excellent, a really good dancer. He has been dancing for seven years but was saying that the tango has only come to Vietnam quite recently. He’s very good at it though and has done a lot of shows before. This is a first for me, but I loved it. "Back in London I’ve never been brave enough to do the show that my dance school puts on every year but now I’ve danced in front of hundreds of people in Da Nang, I’ll definitely want to take part. Mr. Nguyen Ba Canh, Secretary of the Da Nang Youth Union who opened the event commented: "The cultural exchange event tonight is an opportunity for Da Nang young people to understand more about the uniqueness of the Clipper Round the World Yacht Race, as well as for crew members to understand more about the people and culture of Da Nang, Vietnam." 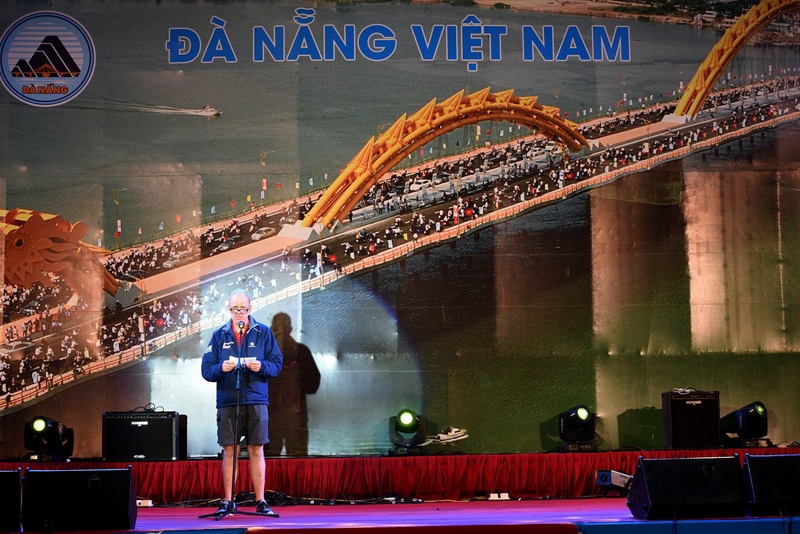 The Da Nang – Viet Nam team was also honoured on the night, with crew members invited on stage to receive gifts from the city, followed by a Q&A session with Skipper Wendy Tuck and local crew member Nguyen Tran Minh An, who has enjoyed celebrity status since arriving into his home city with the fleet. The festivities continued today as crew joined locals to compete in an early morning kayaking race on the Han River. 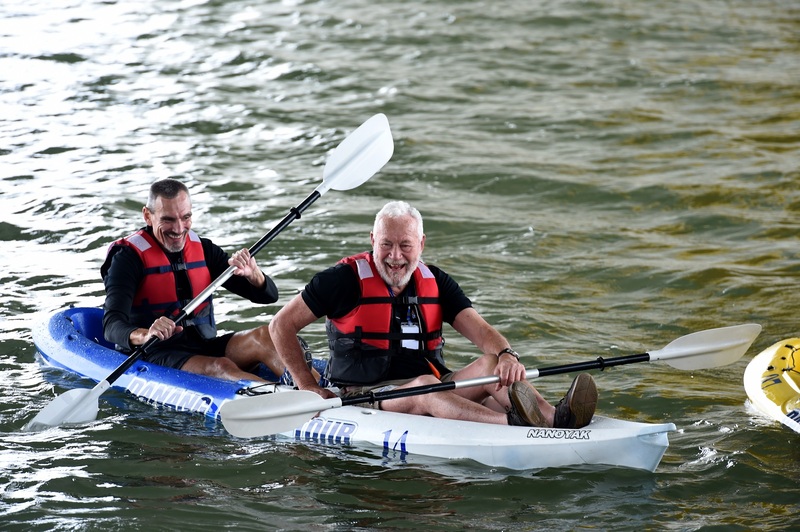 Derry~Londonderry~Doire duo Diarmuid O’Donovan and John Carroll continued their team’s winning streak, beating Sir Robin Knox-Johnston and William Ward, and over 20 other entries to the top podium spot. Tonight the entire fleet, adorned by decorative lighting, will take to the water for a special night parade down the Han River. The city’s swing bridge will close for a rare occasion to allow the boats to pass through after which they will then proceed up to the iconic Dragon Bridge which will breathe fire and spurt water especially for the Clipper Race crew’s enjoyment. 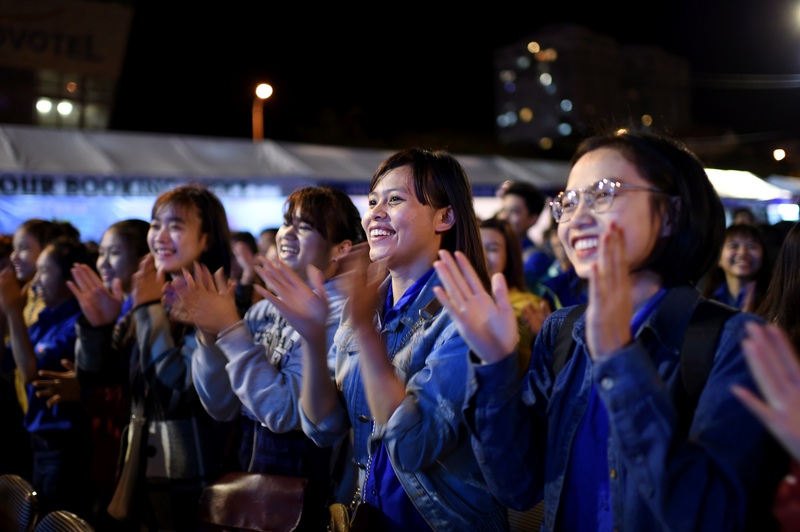 Locals are expected to line the river bank to watch, and DRT (Da Nang Radio and Television) will broadcast the procession live. 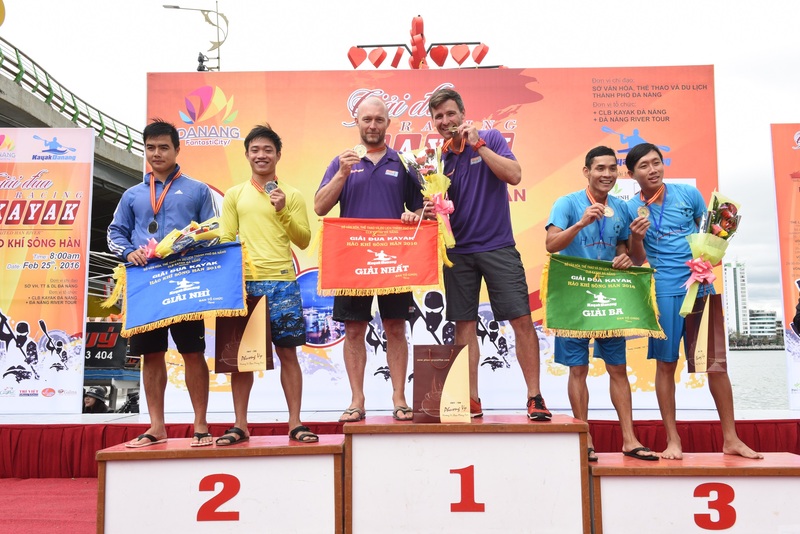 Da Nang has set local photographers the local challenge of the Clipper Race. The city is selecting its top 50 images and will display them in the Clipper Race dome in the race village from 1600 tomorrow. Race 8 to Qingdao starts on Saturday. Boats will slip their lines from 1100 local (0400 UTC) and the race will start at approximately 1500 local (0800 UTC). To watch the highlights of the show, click here.